Interested in raising chicks but don't know where to start? 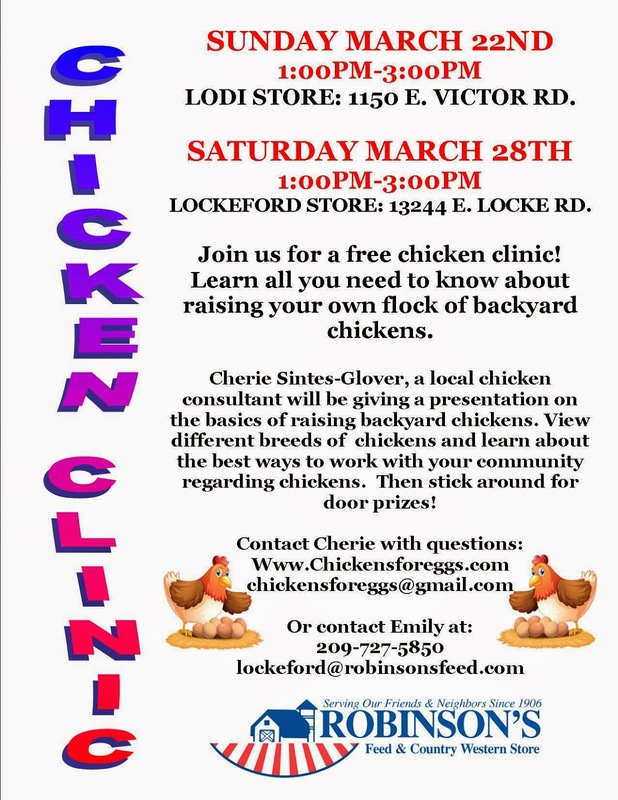 Cherie Sintes-Glover, Urban Chicken Consultant, will cover how to set-up a brooder and care for your baby chickens in a way that will keep them healthy and safe! From what you need to know before bringing the chicks home, to getting ready for them to move to the big chicken coop - she'll explain everything you need to know about raising chicks successfully. This free class, hosted by Farmer's Feed in Stockton, is perfectly designed for those considering raising their own chickens or for those who would like to brush up on their poultry knowledge. Farmer's Feed is located at 1302 E Miner Ave, Stockton. Space/seating is limited, but event is free! I look forward to seeing you there! Are you interested in having a guest speaker at your next garden club meeting, neighborhood watch gathering, or church event? Would you like someone to come speak about various poultry related topics? I'd be happy to help and make myself available for your event. 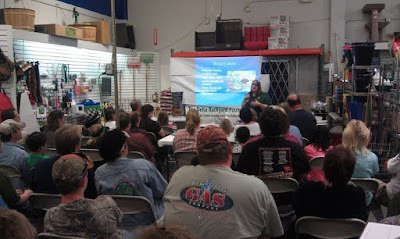 October 14th -1:30pm ~ Keeping Chickens Healthy - Learn how to recognize health concerns in your flock and what to keep in your Poultry First Aid Kit at home. Sign-up at Farmer's Feed, located at 1302 E Miner Ave, Stockton. Space/seating is limited, but event is free! Classes are from 1:30-2:30pm. I look forward to seeing you there! November 4th - 1:30pm ~ Setting Up & Winterizing The Coop - Not sure what kind of coop you need or where it should go? Looking at designs but can't decide? Come learn what coops are best when it comes to bio-security, protection from predators, and protection from the elements. Sign-up at Farmer's Feed, located at 1302 E Miner Ave, Stockton. Space/seating is limited but event is free! Classes are from 1:30-2:30pm. I look forward to seeing you there! July 22nd ~ Keeping Chickens Cool in the Hot, Hot Summer - The heat here in the valley can be deathly to your backyard flock! Learn the important steps needed keep your chickens cool as we make it through the summer. August 5th ~ Getting the Best Eggs -The spring chicks you brought home are now ready to lay those fresh eggs you've been waiting for! Learn how to keep your laying hens healthy, happy, and laying the best eggs ever. See details on the flyer below! Call Robinson's at (209) 368-2716 to pre-register! Call Robinson's at (209) 727-5850 to pre-register! If you are new to raising chickens or are thinking about getting some chicks, this is the place to be! 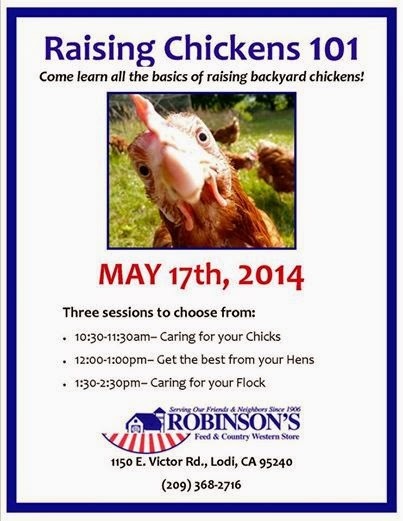 This is our fourth year of classes at Robinson's for people interested in having chickens in their backyard. It's a great chance to ask questions and learn tips about raising a flock of your own. Interested in raising chicks but don't know where to start? I'll cover how to set-up a brooder and care for your baby chickens in a way that will keep them healthy and safe. From what you need to know before bringing the chicks home to getting ready for them to move to the big chicken coop, I'll explain everything you need to know about raising chicks successfully. "Chickens for Eggs - How to Get The Best Eggs From Your Laying Hens"
Knowing what your hens need is important when it comes to getting fresh eggs each day. I'll talk about what things can effect a hen's ability to lay eggs and what we can do as flock owners to get the most eggs from our hens. "Common Chicken Concerns - The Basics of Keeping Your Flock Healthy"
As a chicken owner, you are responsible for keeping your birds healthy and treating them effectively if they become ill. Learn about common chicken concerns and what you can do to prevent problems, as well as how to take bio-secure measures with your backyard flock. I will also take some time to talk about common myths and best practices. As always, Robinson's is offering some fantastic door/raffle prizes to all those who attend. Please join us! For more information send an email to chickensforeggs@gmail.com or call Robinson's at (209) 368-2716. 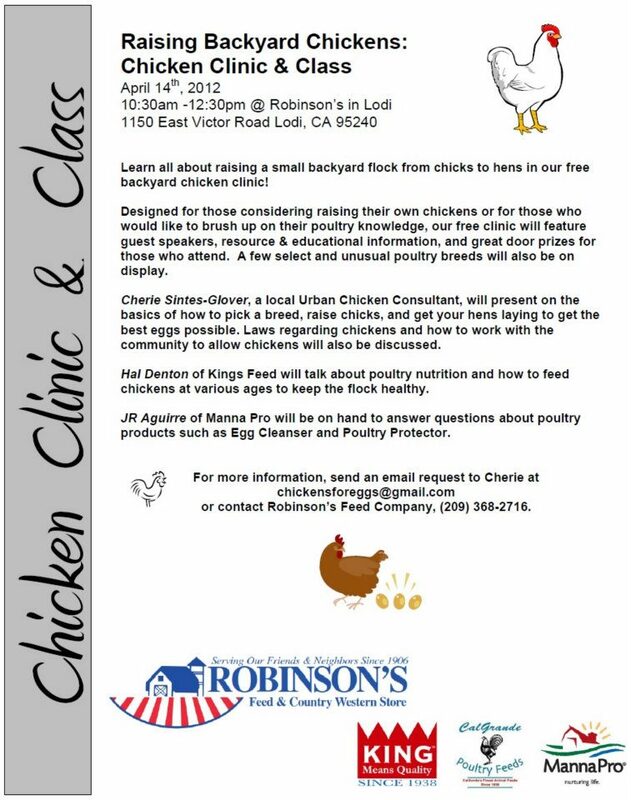 Robinson's Feed has invited me to come back & speak on "getting started with chicks". Join us for a free class Saturday, March 16th at 10am, Robinson's Feed - located at 1150 E. Victor Road, Lodi, CA 95240. This class is perfect for those who are planning on buying chicks this spring, or those who want to know what it takes to raise chicks successfully...before they dive in head-first! Interested in attending a class on raising chickens? If yes, please ask to be added to our class list, and we will let you know when and where the next one will be held. Send an email to: ChickensForEggs@gmail.com and request to be sent an "email alert" when we send out information about a future class. No worries, we will not distribute your name or email address!